When John Sebastian had to cancel his evening at the Freight, Laurie Lewis and Tom Rozum jumped at the opportunity to put together a celebration of the music of John Sebastian and the Lovin' Spoonful, as well as some of the music that influenced John, who wrote such classics as “Do You Believe in Magic,” “Daydream,” and “Summer in the City.” Laurie and Tom enlisted the help of the great Seattle-based duo, Orville Johnson and Mark Graham, known as The Kings of Mongrel Folk. Grammy award-winning producer and renowned bassist Todd Phillips rounds out the band. 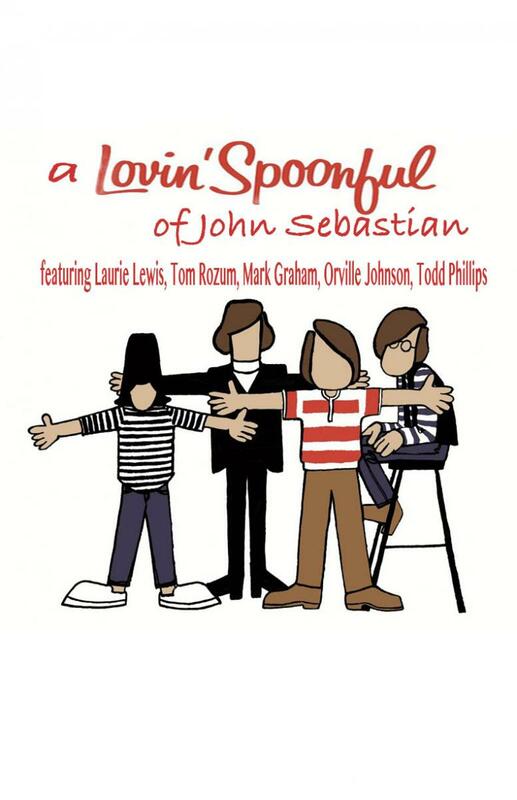 Laurie and Tom have shared a deep and abiding love for the music of John Sebastian and the Lovin’ Spoonful since they were teenagers. Laurie, a Berkeley native, has won the International Bluegrass Music Association award for Female Vocalist of the Year multiple times, garnered a Grammy for True Life Blues: The Songs of Bill Monroe, and recorded more than 20 albums – with the Good Ol’ Persons, Grant Street, Kathy Kallick, and Laurie Lewis & the Right Hands, as well as several solo projects. “Creatively ambitious and utterly unpretentious, steeped in tradition but doggedly progressive,” says critic Andrew Gilbert, Laurie “is a gifted fiddler, deft guitarist, inspired songwriter, and powerfully evocative singer.” Tom, a native New Englander, first joined forces with Laurie in 1986 as an original member of Grant Street, and may well be the rightest of all the Right Hands. He and Laurie collaborated on a beautiful, Grammy-nominated album of duets, The Oak and the Laurel, and Tom also has released a wonderful solo album, Jubilee, recorded with an all-star cast of musicians including Laurie, Mike Marshall, Herb Pederson, and Darol Anger. Mark is a fine singer, hellacious harmonica and clarinet player, and ingenious songwriter. He has penned such poignant and provocative folk ballads as the #1 hits "I Can See Your Aura (and It's Ugly),” "Zen Gospel Singing," and "Life is Hard When You're Dumb.” Orville is a hard musician to categorize because he can do it all. He grew up next to the Mississippi River, learned to pick the daylights out of the guitar and Dobro, and he sings the blues from the depths of his soul. Together, Mark and Orville make American roots music rich in texture and humor. Todd has been a mover and shaker in new acoustic music circles since the 1970s, when he played in the original David Grisman Quintet. Since then, he’s continued to be at the center of such influential bands as the Tony Rice Unit, New Grange, Psychograss, and Phillips, Grier and Flinner. A native Californian, he played with Laurie and Tom for a dozen years before moving to Nashville a few years back. Catch these Freight favorites in a tribute to the music of John Sebastian and the Lovin’ Spoonful – and you’ll believe in magic!